sudden force act to bring desire change. It denote as product of force and time interval for which it acts. The impulse shows the total result of applying force. Impulse turbine works on the same principle. It is mostly used at high heads. Today we will learn about principle, construction and working of impulse turbine. Impulse turbine works on the basic principle of impulse. When the jet of water strikes at the turbine blade with full of its speed, it generates a large force which used to rotate the turbine. The force is depends on the time interval and velocity of jet strikes the blades. This turbine used to rotate the generator, which produces electric power. The number of blades is situated over the rotary. They are concave in shape. The water jet strikes at the blades and change the direction of it. The force exerted on blades depends upon amount of change in direction of jet. So the blades are generally concave in shape. Rotor which is also known as wheel is situated on the shaft. All blades are pined into the rotor. 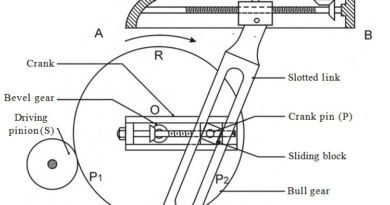 The force exerted on blades passes to the rotor which further rotates the shaft. A nozzle play main role of generating power from impulse turbine. It is a diverging nozzle which converts all pressure energy of water into kinetic energy and forms the water jet. This high speed water strikes the blades and rotates it. Casing is the outside are which prevent the turbine form atmosphere. The main function of casing is to prevent discharge the water from vanes to tail race. There is no change in pressure of water from nozzle to tail race so this turbine works at atmospheric pressure. A nozzle is provided in opposite direction of main nozzle. It is used to slow down or stop the wheel. As we discussed impulse turbine works on basic principle of impulse. Its working can be describe in following points. 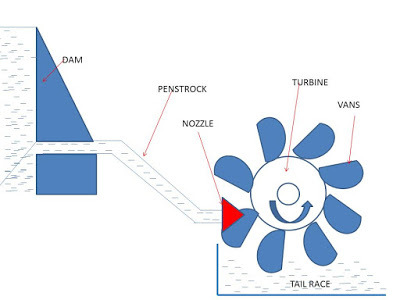 * High pressure water flow form dam (high head) to nozzle (low head). * This water flows through divergent nozzle where it’s all pressure energy change into kinetic energy. It forms a water jet. * The water jet strikes the blade at high speed which rotates the rotor. * It transfers all kinetic energy of water to the rotor, which further use to rotate the generator. * After transferring energy, water flows to the tail race. * This process run continuously until sufficient power generates.For better understanding watch the video given below on working of impulse turbine. 1. It can works at low discharge or at low flow rates. 2. This turbine has high efficiency. 3. Impulse turbine is flexible according to the load condition. At higher load more than one nozzle are used. 4. They work at atmospheric pressure so no problem of leakage. 5. It is easy to assemble. 1. Large size compare to others. 2. Efficiency decreases with time. 3. It required high head witch is hard to control. 4. It is costly to install. We have discussed principle, construction and working of impulse turbine. If you have any query, ask by commenting. If you like this article, don’t forget to share it on social networks. Subscribe our website for more informative articles. Thanks for reading it.